So here I am again talking about home improvement tips that will truly rock your world. This isn’t some good old Al’s post folks, this is your trusty Uncle Andy and his University of Awesome Ideas. As someone who is in construction, a lot of people talk to me about prefabricated stairs. As one would have you believe, they are really becoming popular this season. Like my friend Eric says, the cliché is a cliché for a reason, the same goes for the popularity that prefabricated stairs have enjoyed — and mind you the popularity has been growing month by month. There are both technical reasons and others that will make it so that your ext stair will be a prefab stair and you will thank Uncle Andy for all the awesome advice he has given you. It takes about 10 hours for a team of two carpenters to make a stair for your home or office on site. Add to that the space they will take up and the whole set of raw materials that goes into making it all possible. Then there are other problems with the whole idea of making stairs on site, what if your carpenters mess up? Or if you’ve got the best of the best working o your home renovation project then you can en up with rainy weather which will surely make all the wood swell up no matter where it is or how it has been treated like. 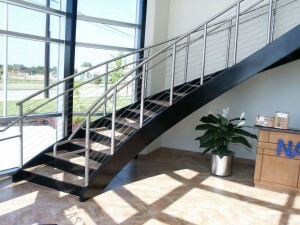 To ensure that you aren’t paying for these problems beyond your control, you need to pick up the phone and order a set of prefabricated metal or wood stairs. That is all you need to do, pick a design, measure the dimensions of the place you are going to install the stairs in and you should have them delivered in a day or two.